The Southern Hemisphere; Queenstown, New Zealand to be exact. Join Nate Hills, Jerome Clementz and Matt Wood as they show us some proper Queenstown Mountain Biking. 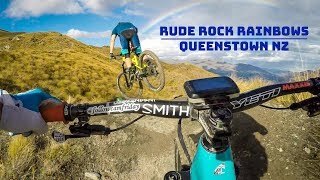 This time the boys bomb down Rude Rock and Rainbow trails chasing each other. As part of Nate’s #followcamfriday series he put together some sick follow the rider footage on this one. As you can see from the video below using a EVO GP-PRO 3 Axis GoPro Gimbal and GoPro Hero 4, it really produces some very steady and breathtaking footage. This gear setup allows Nate to not only capture the rider in front of him, but really brings together the scale of the landscape backdrop. Cheers!